My talk today will be guided by my experience as an Industrial Designer and Furniture Designer, but also as a husband and a father. Many of my observations can be generalised to inform broader design disciplines, in interior design, product design, construction and architecture. So! I was born 40 years ago in New Zealand. When I was 15 I moved to Australia, where I finished school and studied Industrial Design. I spent several years travelling and several more years working in industry before I moved to the UK in 2001. In 2003 I established my studio in East London. We are a small team involved with the design and development of domestic furniture for retail and contract markets. Simply put, we work between furniture retailers and furniture manufactures, facilitating the design and development of furniture. We then license the intellectual property of the designs we create to the manufacturers who supply these markets. Currently we are working on projects here in the UK and in Europe, as well as in Australia and South East Asia. 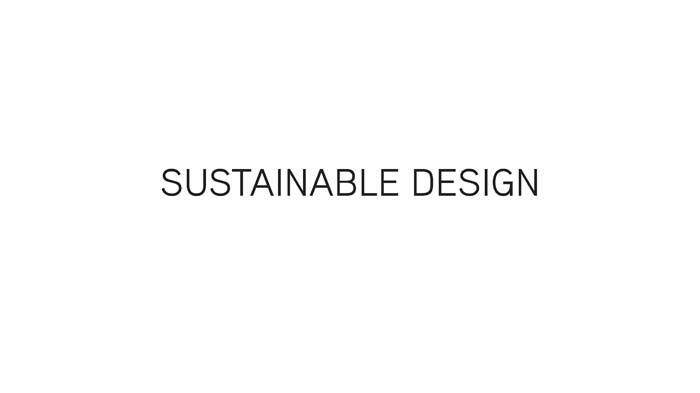 It was a surprise to be invited to speak at Eco-Build this year, so once I recovered from the initial panic, I started to think about the phrase that brings us together today… Sustainable Design. There is not necessarily a logical link between the two words… although together they have become a commonly used phrase along with similar combinations like eco-design and green-design. Something that is sustainable, or sustained, continues without interruption. 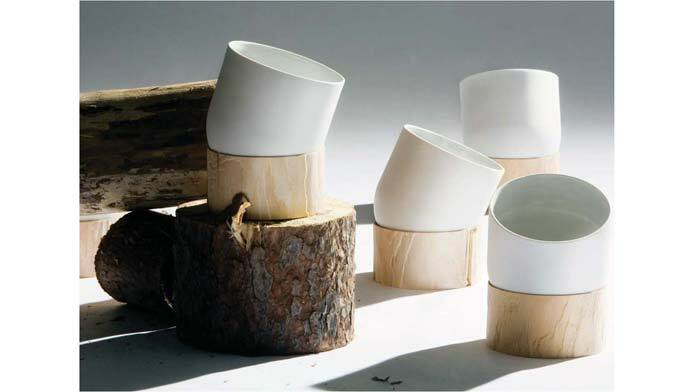 However design is inherently linked with production and consumption, which directly contradicts the notion of sustainability. The word “sustainable” also has deeper implications – it speaks to design that not only conserves resources or otherwise limits or reduces it’s impact on the environment, but also eliminates negative social and economic effects. 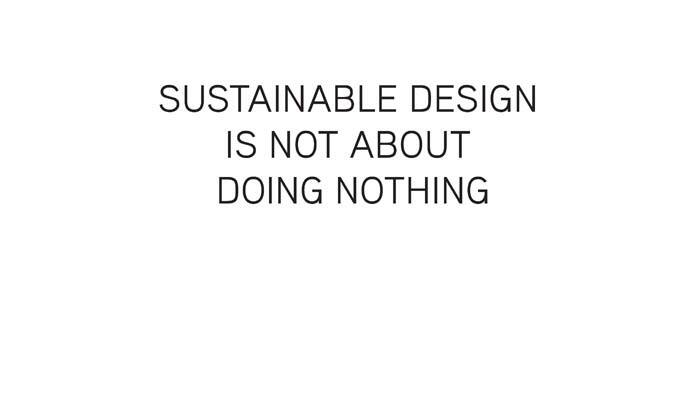 In this way “sustainable design” might differ in degree but not in focus from eco- and green-design. The origins of the modern environmental movement might be traced back to 1962 and Rachel Carson’s Silent Spring, so perhaps unlike my parents’ generation, many of us have grown up with awareness that there are environmental implications for almost every aspect of human activity. 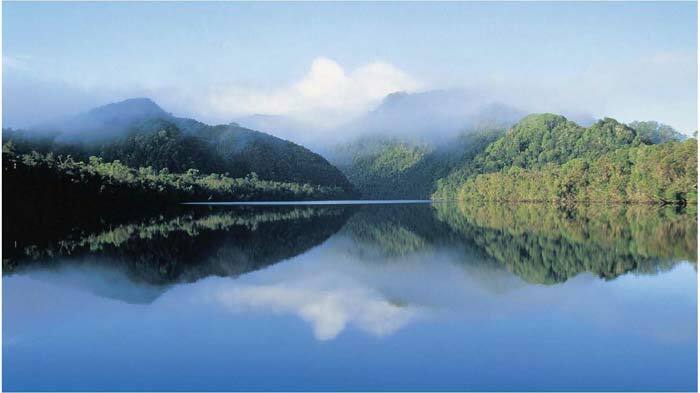 Growing up in Australia I remember the proposed dam on the Franklin river becoming a touch stone issue around which environmental activists rallied. In the UK and across Europe issues like acid rain and nuclear disarmament provided similar catalysts, and together with an increasingly vigilant media reporting stories of environmental degradation, the planet’s ecology hasn’t been too far from the headlines since. So for many of us, there has never been a question of IF we, as a species, influence the natural biosphere of our planet, but by how much. With this context I think it is a natural and perhaps obvious step for designers, aware of the interplay of a multitude of environmental factors, to start to introduce ecological considerations into their design process. However, this occurs by varying degrees and not all products are as successful as they might be. I’d like to show several examples that succeed to varying extents. This bowl that is made by laser-cutting and joining 128 different pieces of cardboard together. 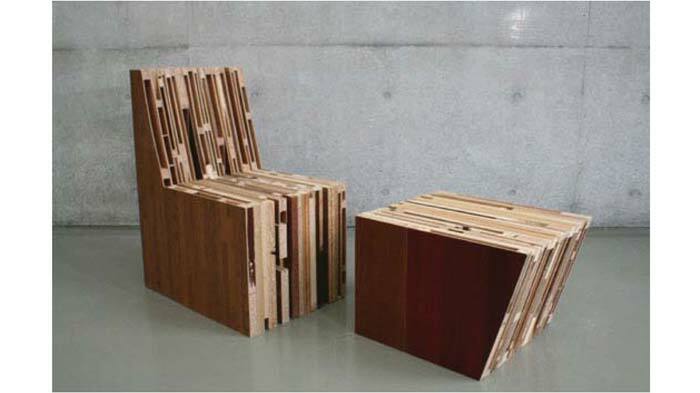 The designer states that it can be recycled or composted at the end of its life. 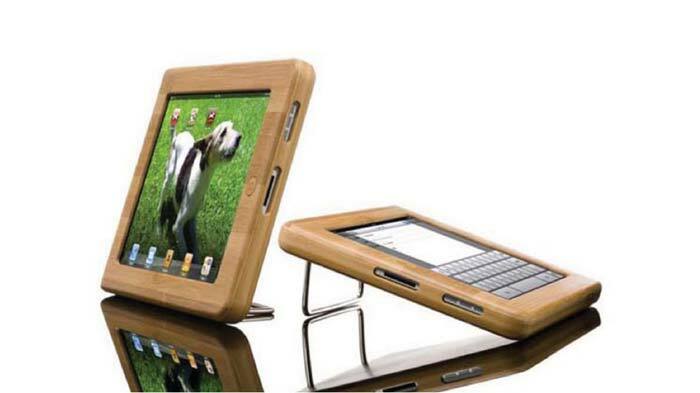 This is a case for a well known piece of consumer electronics that is made from bamboo - sustainable because it re-grows quickly. As these designs illustrate, products bear varying levels of scrutiny. With some, the consideration of ecological solutions are fundamental and intrinsic to the product. In others the sustainable aspect may be exaggerated, superficial or at best, applied with limited scope. As such to then label the product as “sustainable design” can be a cynical act to create a market for the product rather than a sincere attempt to address any environmental issue, and as such, is exposed as “greenwashing”. To tease out the subtleties further, I’d like to look again at my sushi board. Through a series of chance meetings I ended up buying the wooden components from a factory in Thailand, where they were made from rubber wood - a cash crop grown for its sap, which is used to make natural latex rubber. As the rubber wood trees age their productive capacity reduces and so they are cut down and replanted as part of a managed system. So the sushi board was seen as an eco- or sustainable product, and it sold through eco- stores on the high street and online. But in retrospect the choice of rubber wood was purely based on cost – the plates were substantially cheaper than any locally produced option I could find. By sourcing from Thailand, the timber components had to be shipped 6000 miles and then delivered by truck to my studio in east London. Although made from a “sustainable” material the actual sustainable component significantly increased the carbon footprint of the product. Although the “sustainable” nature of the sushi board had basis, the environmental cost of the product as a whole was not calculated and looking back, was significantly higher than I thought at the time. I think it’s fair to say that within the spectrum of sustainable design there is a continuum – on one extreme sustainable design is little more than a marketing ploy without demonstrable ecological credentials, or green washing. On the other side are low energy, low carbon innovations that may represent a significant ecological advance. And falling somewhere in between are the bulk of products, which are better or worse to varying extents. 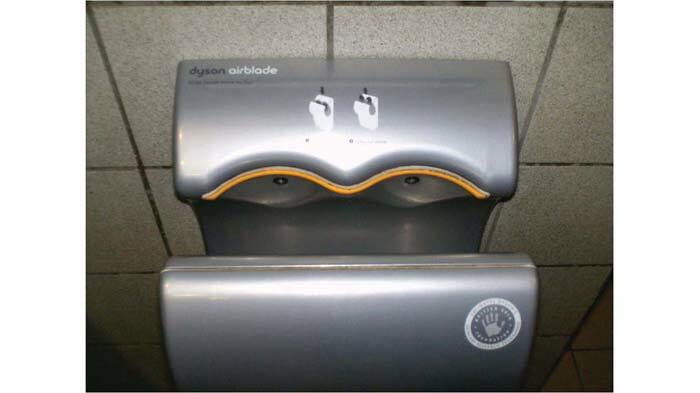 As designers I think we need to assess the sustainable claims of a product with intellectual rigor and honesty. Simply being less bad than the competition does not make a product sustainable. To help with this assessment it may be useful to have a checklist of considerations with which to mark an object or project. - Operation – Are energy requirements minimised and best practice. Does the product consume resources in operation and how are these then supplied and recycled. Carbon - What are the whole life carbon emissions and how do these carbon emissions compare relative to similar products. It’s important to note at this stage that a commitment to sustainability is different to actual sustainability – it’s an ideal, not something that is necessarily achievable across all production. As I mentioned previously, design is inherently linked with consumption – whether it’s a building or an interior scheme, an object or a catalogue. To achieve the physical realisation of the design is to use energy and material resources. Then the product reaches market, and is consumed. And at the end-of-life the product is discarded into the waste system – into landfill or incineration. 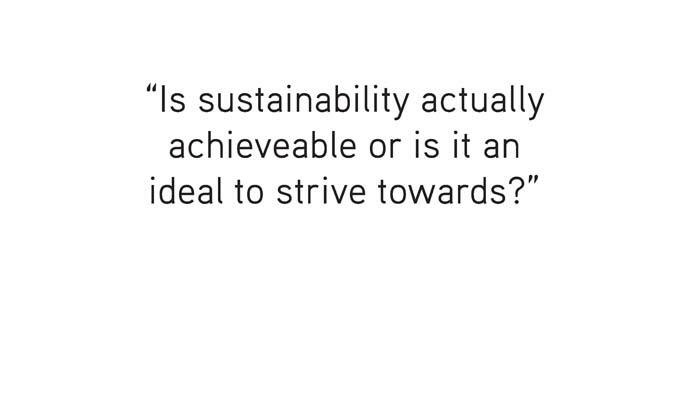 So sustainability is a story about consumption… of resources – the using up or expending of our planet. I’d like to take a couple of moments to look at this a bit further, because I think it informs some of the choices we will have to make, as designers who are focused on sustainable design. When Charles Dickens was born 200 years ago last month he entered a world of 1 billion people. More than a centaury later, when my grandmother was born in 1923 the population was 1.9 billion. In 1944 my father was born and joined another 2.45 billion people on the planet and the population was 3.7 billion when I was born in 1971. 4 years ago when my daughter was born there were 6.7 billion people alive and earlier this year the 7 billionth baby was born – this is an increase from 1 billion people to 2 billion people in the 19th centaury and from 2 billion to 7 billion people in the 20th centaury. And by the middle of this centaury it is estimated that our species will total 9 billion. With current rates of consumption it’s been calculated that human activity is using the biomass resources of 1.5 planets, which is an incredible statistic to absorb… One-and-a-half planets – that’s 50% more than Earths capacity to provide the resources and absorb our waste. But how is this even possible? To maintain our levels of growth and consumption, our economies have been taking vastly more resources than are sustainable (stealing from the future) and selling it in the present to drive short term economic growth or GDP. Even worse, despite this there is still gross inequality, and for every person on the planet to maintain a standard of living equal to the middle class in any developed nation, it would take the combined resources of 6 planets. In the industrialised economies of the developed world, carbon emissions are the most urgent and crucial issue. Each year we pump into the atmosphere about 30 billion tonnes of carbon. This additional mass in the atmosphere acts like a blanket trapping heat radiating from the surface of the Earth and has already started to change established climate patterns, melt polar and glacial icecaps, with measurable sea level rises, in addition to more subtle effects such as increasing the oceans acidity, which is dissolving the shells of the tiniest invertebrates that form the first link of the marine food chain. Aside from carbon emissions our planets biosphere is facing a staggering level of impact from human activity. By mid-centaury urban air pollution is forecast to become “a bigger global killer than dirty water”, responsible for nearly 4 million deaths annually. Identified in an OECD report released last week, along with climate change, loss of biodiversity, water and the health impacts of pollution, the report said that global greenhouse gas emissions could increase by as much as half, as energy demand rises strongly. Water demand is also likely to rise by more than half, and by 2050 as much as 40% of the global population is likely to be living in areas under severe water stress. This is quite frankly a terrifying thought. 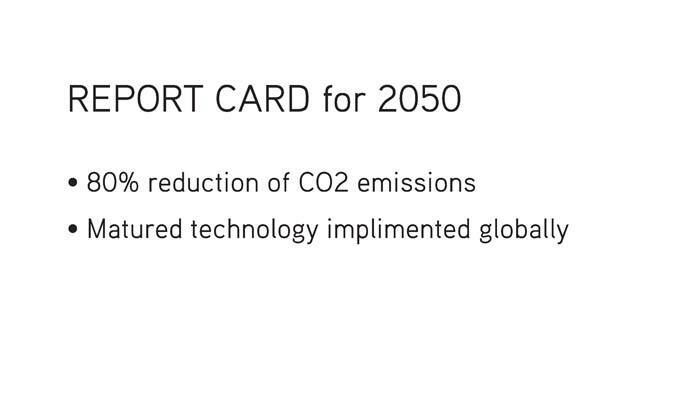 Looking at the report cards the global community will need if we are going to pull through this crisis, by 2050 we need to have reduced carbon emissions by 80%, requiring implementation of massive and scalable energy technologies across developed and developing nations. And by 2020 the interim target of 20% reduction has been set. Much of this will be met by efficiency measures and the development of market based incentives like carbon emissions trading. People in developed nations aren’t going to reduce their levels of consumption. And every day in developing nations 8 million more people join the middle class, increasing consumption levels further. 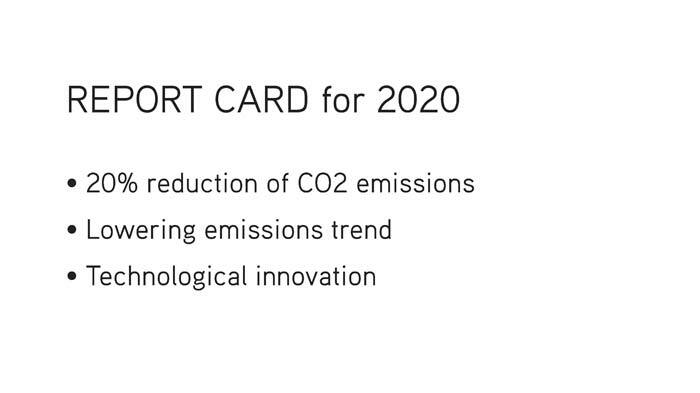 Yet it is clear that we urgently need to drive emissions to zero and so we are going to rely on technology to provide the solutions. A fast pace of innovation and breakthrough is essential. And that is why it is so important that you are all here at Eco-Build today - every company and every visitor are making a statement about their commitment to solving this crisis. Out in the halls are a multitude of technological breakthroughs that are collectively part of the developed nation’s solutions to implementing the urgent carbon emission cuts needed - smart innovations that do more while producing less carbon are an essential part of any global solution. The actual technological breakthroughs may be left to the scientists and engineers, but it is the designers who specify and implement these innovations. 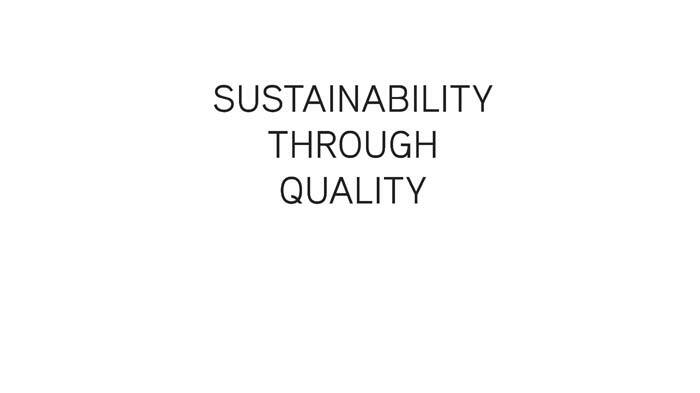 Every designer needs to incorporate new and cutting-edge environmental technology into their knowledge base, to become experts in the field of sustainable products and to prioritise ecological considerations, carrying our clients and customers with us. Far from the cynical use of eco-products as greenwashing, we must integrate truly sustainable materials and processes into the core of all the projects we work on, or products we manufacture. This will only come from a deep and informed understanding of the nature of the problems we are facing, and the new solutions becoming available through innovation. In this context, industry fairs like Eco Build are not only essential but invaluable. Our society is no longer sustainable and the standard model of production and consumption is limited in the extent to which it can change customer behaviour. When a product is designed to be used and then discarded, the resource flow is strictly one-way, resulting in loss of energy and the material resource of the product. 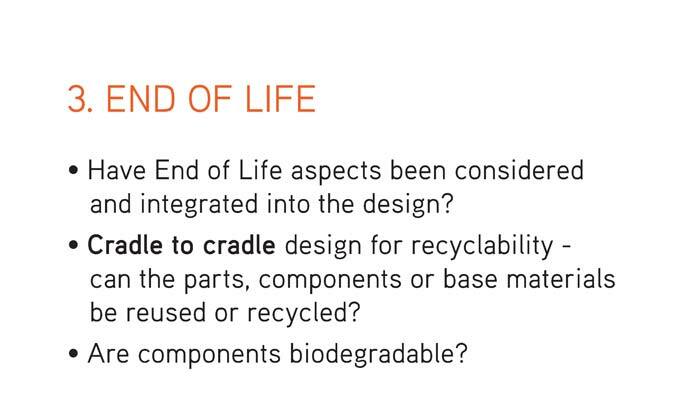 Design principles such as DFA or design for assembly must give way to holistic principles such as cradle to cradle, where all the end-of-life aspects of a product are considered at the time of design, including the initial selection of materials, design for assembly and disassembly, and reuse or recycling of all component parts. In this way, end-of-life products are valued as a resource for new production and are continually recycled, not lost as waste discarded in landfill. As designers it is our responsibility to ensure that our products can be reused again and again, whether as intrinsic parts or as components or base materials, eliminating further carbon emissions and resulting further to gains in water, soil and air quality across the biosphere. On an even more fundamental level, design needs to break from its link with consumption, embracing an approach focused on combining humanity and ecology in equal parts. Instead of being used as a tool of consumerism, creating desirable products that change incrementally, design thinking as a methodology of innovation needs to be applied to creating active systems of participation. As designers we are all practised at integrating opposing constraints, exploiting the contradictions of a project to drive creative solutions. By getting involved in the search for innovation we can help to define new solutions and breakthrough technologies. Designers can also drive market based innovation and change through our supply chains by requiring information on whole of life carbon footprint calculations for all materials we consider for a project. If the carbon footprint of materials were used as a guiding principle in sourcing and decision making, then it would create a pressure for industry innovation. PC based tools are available to simplify the complicated calculations needed to arrive at the actual carbon footprint of a product or project facilitating like-for-like comparisons. As well as cost, suppliers would compete on lower carbon emissions to gain a market advantage. And extending this logic, to minimise carbon footprint, suppliers may source materials more locally to projects and markets, promoting local economies and reducing shipping. Finally, I’d like to finish on a more personal note. My father is an antique restorer and so I’ve grown up my entire life with very old, very well made pieces of furniture and it’s from this background that I want to make my final observation. To me it’s obvious that the best way to make something sustainable is to make it last. This is a notion of sustainability through quality for which antique furniture is a good example. Furniture can last a lifetime, or many lifetimes and quality is the key – quality in design, quality in manufacture, quality in materials, and quality in care. Although my design process is far from perfect, I aim to minimise the impact of my furniture, where possible using natural materials and processes. I work with manufacturers who supply markets local to their own production – working with European manufacturers for European customers and Australian factories for the Australian markets – I discourage the shipping of products to distant markets. I question material selection and manufacturing processes, investigating alternatives that may lead to better ecological outcomes. I have worked with manufacturers to gain FSC certification, ensuring that all timber products used in the furniture are sourced from sustainable forestry resources. But it is not enough to consider just a material’s sustainability – we need to look at the wider environmental impacts including carbon footprint, and total energy input. I also think it is important that, as designers we don’t get tied into the fashion cycle where we react to fast moving trends. 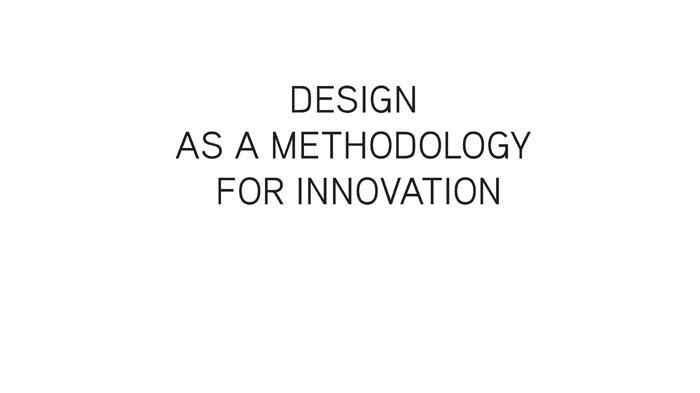 We need to resist the interpretation of design as styling, which leads directly to the cynical commodity driven marketing model; but use the methodology of design thinking to consider the complex aspects of a project to arrive at solutions that are appropriate for our markets, in the context of human and ecological interaction. SUSTAINABLE design is not about doing nothing - Together we can make sure there is a life worth living for generations to come. I was called in to speak fairly last minute and so the preparation wasn't as smooth as it might have been. If I have referenced your images or ideas without attribution, please get in touch and I'll be happy to sort it out.